Wouldn’t it be nice to have a pair of ruby red slippers, just like Dorothy. These past few weeks my home has felt like the Wizard of Oz. I just want to tap my red slippers together and get back to some normalcy. I am just thankful that God knows best, and no matter what, He is always with me. And in all honesty we, as believers, we know that our real home is not our earthly home, but our home in heaven with Jesus Christ. So one of my friends, Mrs. Henton had asked for me to make red velvet cupcakes. 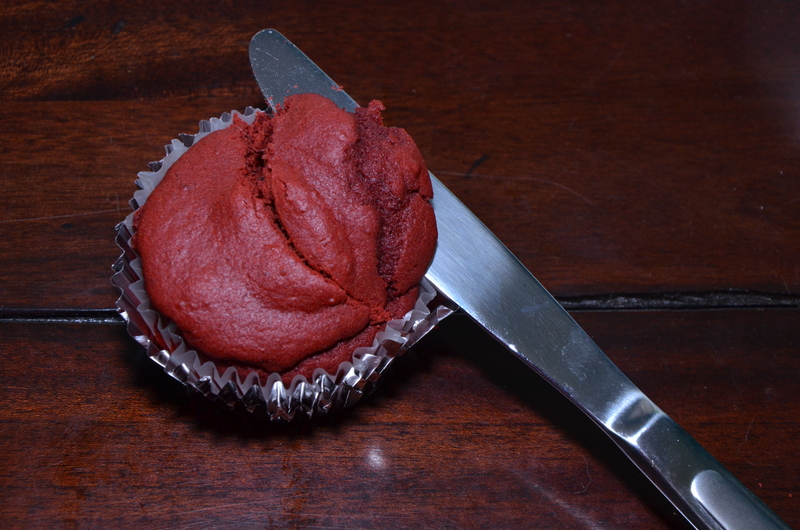 And it just so happens that my cousin asked me to make red velvet cupcakes for her wedding. But I couldn’t just make any old cupcake (Boring! ), I wanted to do something fun with it. 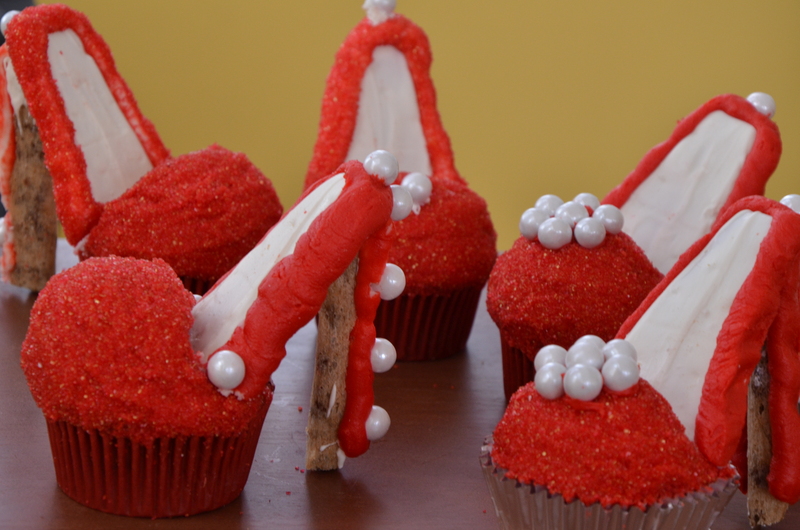 So I made shoe cupcakes. Now they might not be magical, but they are sure to give you a magical sugar buzz (gluten free buzz, of course). The design for shoe came from this great cupcake book, Cupcakes, Cookies & Pie, Oh, My! and the recipe was adapted from Cupcakes Sensational Sweet Treats for Any Occasion. 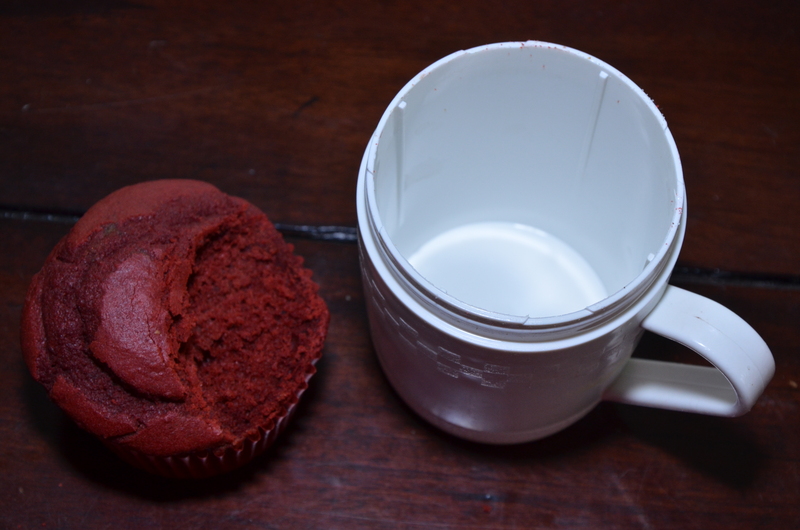 To start, bake your cupcakes according to the Red Velvet Recipe. Once the cupcakes are cooled, carve out a semi-circle with a cup or a cookie cutter. Frost with my butter cream frosting recipe. (Note: replace the shortening with the entire bar of cream cheese. Mix and add 1 Tbsp of shortening to the frosting at a time, until you get the desired consistency. 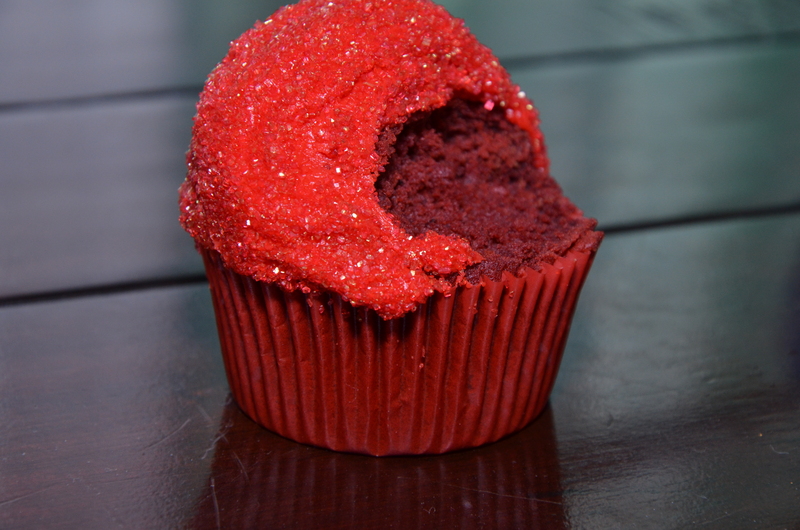 You will want the frosting to be a little softer than normal otherwise it will not adhere to the cupcake). Frost red on the toe. (do not frost the cut inside) Dip the toe of the shoe in red sprinkles. Coat liberally. Frost the inside of the shoe, white. Refrigerate. Now, sorry but I didn’t take pictures of doing the graham cracker. I know I goofed. Take your graham crackers and cut the corners and sides diagonally to create the sole of the shoe. Be very carful. It is better to use a sawing motion rather than to cut otherwise you will break the cracker. Line a cookie sheet with parchment paper. Melt the chocolate wafers in a microwave safe dish in 30 second increments. Stir well to a liquid consistency. Dip the crackers in the chocolate and coat completely. Put on the tray and refrigerate until hard. Melt the chocolate wafers in a microwave safe dish in 30 second increments. Stir well to a liquid consistency. Dip the crackers in the chocolate and coat completely. Put on the tray and refrigerate until hard. While your cupcake pieces are in the refrigerator cut your Choco sticks in half. This is a very tricky thing, so have patience . . . and extras. Cut the top at an angle to adhere to the sole. Push the wide end of the coated graham cracker into the cupcake. Place against a bowl or a cup to steady the sole as you work on the heel. Take your Choco Dream stick and attach to the sole with the chocolate. If it has hardened just reheat for 30 seconds. Hold until it sets up. 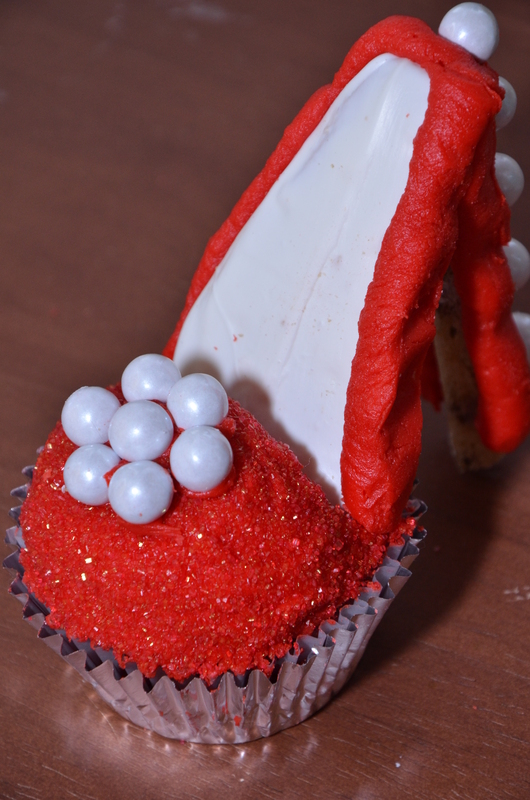 Pipe red frosting around the sole and wherever you want to add embellishments. Add Sixlet decorations right away, before the frosting dries. Put your own spin on your shoe, and just have fun! « Are the Pebbles Fruity or Just Me?